A little while ago, I was invited to the launch of the Four Season's Vintner's Reserve at the Four Seasons Chateau in Roti, an hour away from Pune. Besides the wonderful time we had at the launch party, the socializing with some of the best from the wine and spirits industry and the overall grandeur of the Chateau, I was also very keen on exploring the venue for a wine holiday - an option that is on offer. The trip was a wonderfully organized effort of the young ladies of Script PR and the hospitality at the Chateau was spot on. I found myself with another friend from the journalistic fraternity on red-eye flight on Go Air to Pune on a Saturday morning. Getting to Bangalore's airport early in the morning is a pleasure, considering how you can use the expressway the way it is meant to be used. The same however, cannot be said about serpentine lines at the security counters at BIAL for early morning flights. Anyways, all went smoothly and we were soon seated on board. Arriving in Pune (my first time at the airport), the emptiness of the airport despite a full flight coming in was a little disconcerting, but I was forewarned by friends not to think twice about it. Anyways, luggage in hand, we found a waiting cab for us and settled down to a leisurely hour's drive to the Four Season's Chateau. The roads, being the early hour that it was, were relatively empty and the highways broad and smooth. The chateau makes quite a first impression, with its imposing gates, long tree-lined driveway and its grand structure. Driving around the massive fountain and water body that is centrally placed gives you a lot to look at as you approach the building. The idea of the Four Seasons Vineyard began to take shape in 2007 as a greenfield project. It was ready in 2011 and the expansive facilities added over the years. 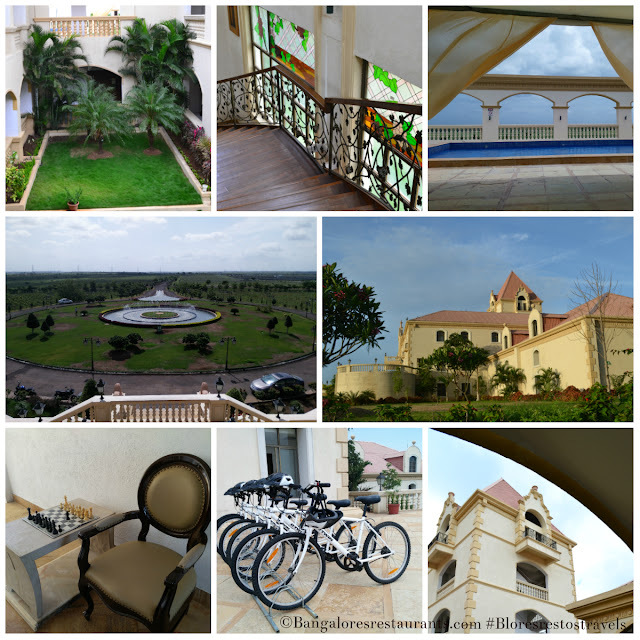 Here is what the property holds for you - you begin by climbing up majestic stairways that open to a vast verandah that takes you across the breadth of the massive structure. Here is where you will also see some mountain bikes parked for you to take over the estate hilly terrain and experience the areas surrounding the vineyard like a true adventurer. The reception is decked out subtly with the Four Season's branding, complete with maps, casks and wine displays to look at when you are waiting for your room to be organized. Right past the reception is the estate's tasting room and store to pick up some of the seven varietals that the brand currently offers. An ornate metal and wooden staircase takes you a floor up where you first see the chateau's restaurant that offers an indoor dining option and a more majestic open air party deck that overlooks the central fountain. A lovely space to be nursing a wine glass late in the evening. The video above gives you a peak at the view. The floor also has the rooms spread out on it. There are a total of 10 rooms and 4 suites named after some of the famous wine regions from all over the world. The chateau also houses an open air pool with an inbuilt jacuzzi, along a large deck that makes for the perfect setting for an evening of BBQs that may easily be arranged on request. I stayed in one of the rooms and also managed to get a look at how the suites look. The video below takes you through a tour of both rooms. The rooms are large, with the suite offering an added living room space. They are air conditioned and come with balconies that overlook the beautifully landscaped inner courtyards. A kettle with basics, all the toiletries you need and a flat screen TV makes this a fully loaded space for a great wine staycation. Take a look at the Rooms and Suites at the Four Seasons Chateau. The joy of being on a wine vacation is that you have everything you could possibly be interested in. 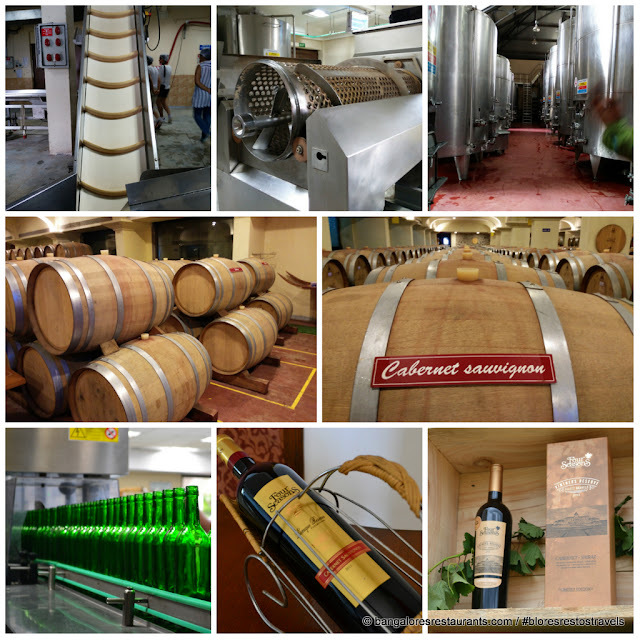 Acres of vineyards to wander through, a state-of-the-art processing plant, expansive fermentation rooms and of course the gorgeous barrel rooms and a bottling plant. You will be taken through all of these places on a detailed tour and will enjoy the experience of witnessing first-hand how things go from grape to wine. And if you are lucky, you will also get to sample some of the wines, still in the process of maturing, straight from the barrel. Go on a detailed tour and take in the wine making process at Four Seasons. So you have well appointed rooms, a jacuzzi pool, open to sky BBQ in vineyards - what more you ask, well there is more. 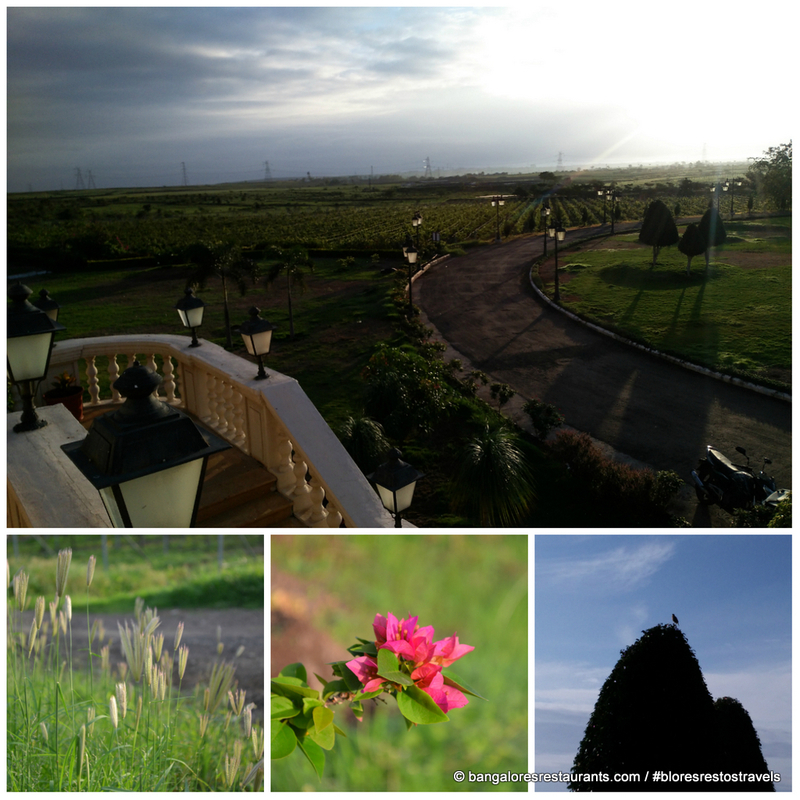 The property is best experienced early in the morning when you can take a long walk or trek around the estate. Chances are you are going to spot wild deer, a boar or two and scores of beautiful little birds. In fact, when we set out, we managed to catch the sky just about shedding its cloak of darkness and the first streaks of daylight coming through. What made it so much more beautiful was that we could still see some stars in the sky on one side and golden sunlight on the other! The early morning sky from just outside the reception. A look at the terrain behind the chateau - makes for a lovely early morning walk. The Four Seasons Chateau takes in visitors all through the year, but they do recommend that you drop by during the harvest seasons (Feb-Mar) when you can witness the wine making process in its entirety. Is it child-friendly you ask? Well, as a company policy, groups where some members are under the legal drinking age of 21, a member of such groups, who is above the legal drinking age, must sign a declaration letter when they reach the winery. Children must be strictly supervised at all times.